HP announced what it calls a "new category" of home printers today. The Photosmart Premium with TouchSmart Web basically is a fancy-named home printer with a 4.3-inch LCD touch-screen panel attached to the front of it. The printer can connect to the Internet, which HP says has never been done. It seems like HP is trying to ride the iPhone social phenomenon, both with the design of its new machine and with the fact that the company has partnered with others to develop printer "apps" that help you print coupons or customized news reports. Among HP's first print app partners are USA Today, Google, Web Sudoku and Fandango. HP says the printer will retail for about $399 and hit stores this fall. But guess what? Smartphones, netbooks and latptops - even the Kindle e-reader - connect to the Internet, too. 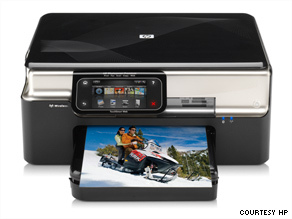 Why not make printing off of your phone easier? This begs another question: Aren't we moving past the printed age? Obama is making health care paper-free. Environmentalists decry paper waste and printer ink pollution. You can scan coupons from a smartphone, airline boarding passes are going electronic and news is rapidly migrating onto the Internet. Why print? Or, if you do want to print something, why not just print from your computer? In an interview, HP senior vice president Stephen Nigro acknowledged that printing will eventually go away. In the near term, however, home printing is expected to grow, he said. "We look at it as an evolution, but we don’t see printing going away for some time," added Nigro, who said the Web-enabled printer is targeted at tech-savvy consumers. He touted the new printer as a "big deal," saying it brings "the printing experience into the Internet and Web-connected age." What do you think: Is this really a big deal or just corporate hype? For 400 bucks, would you buy one? I am a very techy person , I have two laptops, a pc, a mini, an ipod touch and a window mobile device. I would absolutely NOT buy this product. Instead of making the printer get on the internet, I would be interested in a device that made printing from several devices in the home easier and cheaper, without having to purchase an expensive networked printer. I think this is a great idea! We all know that all of our devices have different and proprietary operating systems. using the web ties them together without have to beg every company to open there doors. I applaud HP in finding a work around. Now for the price: maybe 200.. but not 400! Mary, you can print from many devices without expensive equipment. My printer is attached to my desktop. I then go into windows and share the printer. Now through my wireless router (used with my dsl connection) I can print from my laptop to that printer (which is not a network printer, just a cheap USB printer). The only caveat is that the desktop has to be turned on in order to print. Personally, I think this is just corporate hype. If you want to print something, who wants to stare at a tiny screen with most likely an inadequate interface to efficiently navigate to a desired printable item? Granted, if you know what you are looking for to print, then I guess this would be a time saver, but who really knows EXACTLY what they want to print every time they head to a printer? I just think its an expensive toy that only people who want it as a novelty will purchase. This shouldn't come off as rude or anything, but have you tried sharing your current printer(s)? If you live in a studio apt, and dont yet have a printer – and all you do is check email – why not. The most inexpensive and best home printing solution from multiple devices is to buy an older HP Laserjet 4000, 4050 or 4100, with a Jetdirect card, which allows Ethernet between your router and the printer. You can find them for $75 -$150 in fine condition, with as much as 80% life left before a new drum is needed (200,000 copies). Refitting a 4000 series printer without a Jetdirect card takes about $20 and 5 minutes. These printers are the ubiqutious off white square shaped models, found in almost every office. Even though they be as much as 12 years old, that have the reliability that Maytag should be envious of. They print 17 ppm, a cartridge is rated for 10,000 copies, and only costs $40 reloaded or about $135 new. Compare that to inkjet cartridges, which are good for 200 pages if you are lucky. HP 4000's standby mode power consumption is low at about 36 watts. Duplexers are available for those wanting to save trees. I think I can hear Steve Jobs laughing at Hewlett Packard. What a waste of what could of been stock holders dividends. As an IT Professional with every networked gadget known to man I agree with Mary... Why do we need a printer that connects to the internet to print from a computer that also connects to the internet? Isn't that just creating a middle man... I would never use such a printer. I second the fact that we need to make printing from our multimedia devices easier. I want to be able to walk into my house and print from my Blackberry wirelessly without having to setup a wireless maze of connectivity and infratructure. HOW ABOUT CHEAPER INK HP !!!!! Well, I have a need to have a couple of remote printers, since I send material to offices in different counties. I would prefer not to e-mail, because I cannot have these documents edited/modified once they are recieved. Faxing can be slow. A remote printer connected to the Web is a good solution. With an internet connected printer, you could print anywhere in the world and that printer needs no PC or local network. I can think of many fax like applications. It will sell. But there is not much of a home market. WE won't be buying this printer at $400 just to get free print cartridges. Keep in mind, 90% of these gadgets are just that. C'mon people! This compliments the Internet connected refrigerator quite nicely. No, I would NOT buy this printer. It took me a long time to wean myself off of printers and printer companies that sold me ten cents worth of ink for forty-five dollars. I have a simple laser printer now for my text documents, any other printing I might need to do can be done at my local Kinko's or even the corner drug store. Ink jet printers are a huge consumer ripoff and this one seems lamer than most. While an interesting consept. There are statments made above that many of us already have a home network and 1 printer hooked up to that network. While there are some senior citizens that would love to "surf & a easier way to just print emails or photos " there are already internet appliances that fill that need, with a much smaller space saving design. For these seniors afraid of a computer do not seem so afraid of an internet device. Also depending on the market the small lcd screen would be harder for older to people to use and see. I would love to see more designs come out for an internet device /printer that would be useful as far as form and function for our senior market, that will not touch a pc at this point. I'd rather buy a computer-printer all in one. Like, one of those all-in-one computers (like an iMac or something) that can also print from within the computer. That'd be pretty cool. I can see the use of it if your computer is not connected to a printer. I dont see a market for this though, since printers usually come with computers. This may work in a small office that is too cheap to connect their computers to a printer. Not for me! I do a lot of printing – but I gather all my information into nice formulated docs (like in Apple Pages/MS-Word, OneNote, CP Notebook, PDF – or something along these lines). Would be better to me would be a more economical way to setup wireless & hardwired color laser printing from all my devices. Dell Work computer – does not have wireless, it is hard wired – printer is USB. Printing from my iphone? – oh a dream come true. Give me a nice affordable color laser printer that will print from every one of these devices. Also could you image downloading a 3 meg PDF and then waiting for it to print? what would the point be? I download a PDF and only print the pages I need – but then I have it on my computer should I need to go back to it. New Printer virus, spy-ware, adware & mal-ware on the way to a printer near you. So now you'll need to by protection for the printer too. The reason why mobile devices that can connect to the internet are so valuable is because they are Mobile. It is for that reason that they have done so well. Your computer is better than your phone, but you can't walk around with your computer. It is for this same reason that this printer will fail massively. You can't walk around with your printer in tow to connect to the internet, therefore its location will be relatively static. You know what is also relatively stationary? Your computer! Which will be much more powerful and overall more useful than your printer. How could anyone have thought that creating this with a price point of $400.00 was a good idea? I got (what I feel) is an awesome printer/scanner for $200.00 and even that is not really justified by the amount I actually use it. Seems like a waste of development to me. I wonder why HP would green light this product. It was probably some exec's pet project. To the user that wanted an easier way to send print jobs to printers- try downloading Apple's Bonjour tool. Simple and easy way to manage your networked printers.